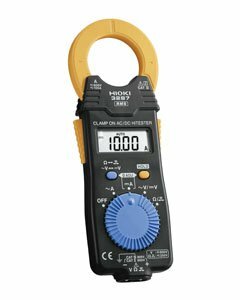 Hioki clamp on meters are best-in-class measuring devices incorporating Hioki’s expertise in current sensing technology. The Hioki 3287 is an AC/DC current and voltage clamp meter that also measures continuity and resistance, featuring a double jaw lever and slim profile for easy access to crowded wires. 10.00/ 100.0 A, Basic accuracy: ±1.5 % rdg. ±5 dgt.